Generate high quality QR Codes, edit the QR Code destination and get detailed analytics. With Splitter you can generate high quality QR Codes for free. If you need to edit the QR Code just log in to our easy-to-use administration interface. Make sure that anyone can scan you QR Code. Thus, it is important that you use high quality simple QR Codes. Less dots there are in the QR Code, the easier it is to scan it. Splitter uses very high quality QR Codes to ensure top scanning performance. There is one more thing besides being able to edit the link/destination of your QR Codes at any time. Splitter also enables you to generate intelligent QR Codes and short URLs that support multiple destinations based on your customer's country, city, device type and more. 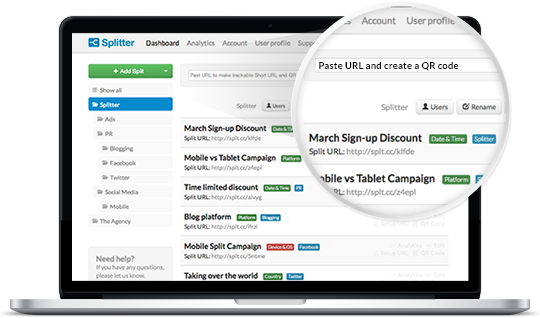 Learn more about the unique targeting features of Splitter on our tour page. Generate a QR code for free.